You are currently viewing all posts tagged with water. I've been happily using my AquaRain filter for a little short of a decade now. My only complaint about the system is that the filter elements degrade slowly enough that I rarely notice the decreased flow. Cleaning and assessing the health of the elements (which is done by measuring their circumference with the provided tool) should happen periodically, but it isn’t the type of thing I’ll ever think to do myself. As with my water rotation, I let taskwarrior solve the problem for me. This post was published on 2017-07-04 . It was tagged with micro, water. 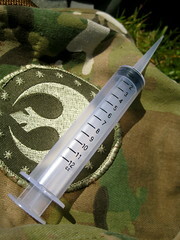 If I could only carry one first aid specific item in the wilderness, it would be an irrigation syringe. There’s a lot that can be done with bandannas, duct tape, and paracord. A multitool, spare clothing, sleeping pad, tarp, poles – pretty much everything in a pack, including the pack itself, can be fashioned into some kind of medical implement with a little ingenuity. But cleaning a wound will always remain difficult. It also remains extremely important. Infection is both very common and very inconvenient in the wilderness, where you’re well away from definitive care. 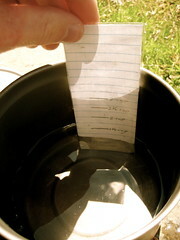 Clean water should always available and irrigation is a simple and effective method of cleaning a wound. But water just poured over a wound won’t do much good. Pressure is needed. Occasionally you might hear people claim that you can fill up a ziploc bag with water, cut or poke a hole in one corner, and squeeze the bag to force out a stream of water. That’s certainly better than nothing, but in my experience the pressure from that is not comparable to the pressure from a syringe. 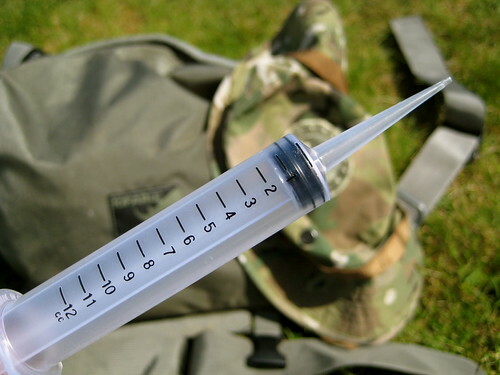 With an irrigation syringe, you can take the cleanest water available (usually your drinking water) and shoot it into the wound. Pressure washing the wound like this allows you to easily clean out all the grit and dirt. There’s no need to go poking around in there with unsanitary tools, probably causing more harm than good. A 12cc syringe like the one I carry costs $1, weighs 8 grams (0.28 oz), and takes up very little room. I can’t think of a reason not to have one in your pack! Remember: a clean wound is a happy wound. You can put all the effort you want into the perfect bandage, but if the wound isn’t clean, you’re going to have some problems down the line. This post was published on 2010-06-19 . It was modified on 2012-11-01 . It was tagged with water, medical, wilderness. I bought one of the newer 27oz wide mouth Klean Kanteens back in March. My favorite bottle is still the old 40oz Klean Kanteen that I keep in my EDC bag, but I’ve been wanting something a bit skinnier that could fit in the bottle cage on my bike. I also was looking for an excuse to try out one of the newfangled wide mouth Klean Kanteens. I prefer a wide mouth opening on my bottles, but my 40oz Klean Kanteen (despite being beat on fairly heavily for the past few years) is in too good a shape to justify replacing it with a 40oz wide mouth. A new 27oz wide mouth bottle that would fit on my bike (not to mention in most car cup holders) and so supplement the 40oz bottle was easier to talk myself into! To go along with the wide mouth bottle, I also purchased a humangear capCAP. This product of questionable capitalization addresses the same problem as Guyot Design’s Splashguard: how to drink from a wide mouth bottle while moving without ending up with half the bottle’s contents on your face and the other half up your nose. 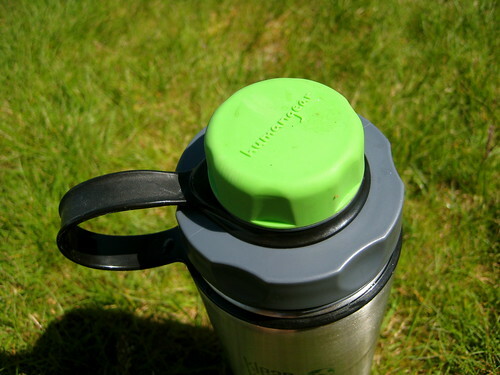 The capCAP allows the user to take advantage of the wide mouth for filling and cleaning (as well as water filter integration), but also provides a smaller opening for drinking. The wider cap has indentations on it making it easy to grab and turn. The smaller cap, in addition to the indentations of the larger cap, is made of rubber, which makes for an easy grip while wearing gloves. The rubber has a tendency to pick up small amounts of dirt and sand, but so far I have not found this to be an annoyance. My habit in unscrewing bottle lids is to hold the body of the bottle in my left hand and unscrew the lid with my right. The problem with doing this with the capCAP is that attempting to unscrew the small lid tends to start to loosen the larger lid as well. All that’s needed to rectify this is to hold the larger cap in my left hand rather than the body of the bottle itself. This forces a change of habit, which took me a couple weeks to get used to, but I now grab the larger cap with my left hand while unscrewing the smaller cap without thinking. I haven’t had a problem with it since. When using the capCAP with my wide mouth Klean Kanteen, I find that it does leak slightly. 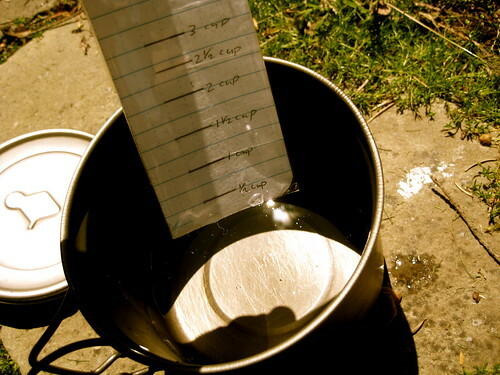 If the bottle lays down on its side for a bit, a couple drops of water will escape from underneath the larger cap. The threads on the bottle’s lip must not match up perfectly with those on the capCAP. 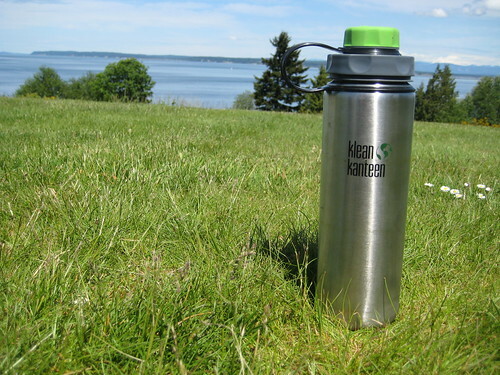 If the bottle was to be thrown loosely into the body of the pack where it could shift around and potentially get a drop or two on some form of paper, I would opt for the more secure closure of the standard Klean Kanteen lid. But when the bottle is in the cage on my bike or stored upright in a pouch on my pack’s waist belt, this small leak is no problem. The capCAP can of course be used on other wide mouth bottles. I also use it on my 32oz HDPE Nalgene as well as my 32oz Guyot Designs Backpacker and have not noticed any leaking with those bottles. It’s a pretty neat product that I think makes a great addition to any wide mouth bottle. This post was published on 2010-05-19 . It was modified on 2012-09-30 . It was tagged with water, review, bicycle, gear. In the past, I used Camelbak bladders as my primary water reservoir. I’ve had three of their military hydration systems and never experienced a leak – except once when I neglected to fully close the bladder’s lid. In snowy, alpine conditions I would chuckle at others whose hydration hoses were frozen shut, while I confidently sucked on my insulated Camelbak hose. The Camelbak mouthpiece always insured a high flow-rate, unlike some other brands, and the hose could be shut off at either end, providing further protection against the accidental leaks that have been known to plague other bladders. But the Camelbak’s durability comes at a price. My 100oz Omega Reservoir (including bite valve and insulated tube) weigh in at 10oz. Not exactly light. So last year, I decided to give Platypus bladders a shot. I had been critical of their toughness in the past, but their 2 liter bottle weighed in at only 1.4oz. With optional drink tube kit and bite valve cover, the full system weighed 3.6oz. It had been referred to as the “gold standard” in ultralight bottles. Too enticing not to pick up. Of course, the low weight of the Platypus system also comes at a price. The small opening makes the bladder less convenient to fill. The tube is uninsulated, and so inappropriate for much cold weather use. 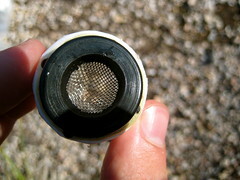 The bite valve has a low flow rate and is prone to leaking. The bite valve cover is cumbersome and difficult to close. And the bladder itself is made of a much thinner and less durable plastic than the Camelbaks. Still, I have been very happy overall with the 2L Platypus bottle. I have not touched the Camelbak once since making the conversion. But now my Platypus has begun to leak. I’ve patched it with Gorilla Tape, which seems to be an effective fix, but it is only temporary. I need to replace the bottle. Nowadays, all the rage seems to be for the new bottles with their ugly colors. The largest of these is 1 liter, and so not an option for me. 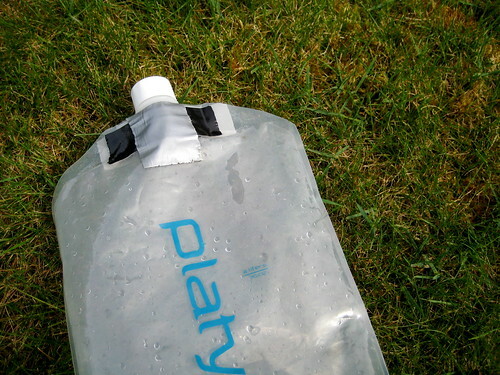 Platypus also now offers two newer hydration systems. The first is the Hoser, which is similar to the old bottle, but with a grab loop at one end and an angled port at the other. The manufacturer’s weight for this system is 3.6oz, which is the same weight that I have measured for my old bottle, hose, and valve. The trouble with the Hoser is that the bottom does away with the traditional expanding bottom of the old bottles in favor of a grab loop. Because of the small opening of the bladders, the best way that I have found to fill it is to scoop up water with something else and pour it into the standing bladder (a method made popular by Jason Klass). For one person to achieve this, the bladder has to stand on its own. The Hoser bladder will not, so it isn’t an option for me. The other new offering from Platypus is the Big Zip SL. The zipper closer on this addresses the difficulty of filling. The manufacturer’s listed weight is listed at 5.5oz (though I’ve heard reports that it is actually heavier): still a good deal lighter than the Camelbak, but significantly heavier than the old bottle system. I could go back to the old Camelbak, but the weight deters me. It is also difficult to pour precise amounts of water out of the Camelbak bladder for cooking, which is a disadvantage now that I’m used to the Platypus bottles. The other option is a bladder from Source. I first heard of these with MilitaryMoron’s review. They have many features that are attractive to me, but I haven’t seen anybody post an accurate weight. 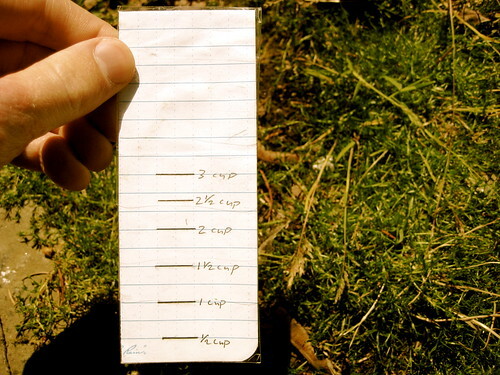 Source themselves list their 2L bladder at 0.53lbs (8.48 oz), but they have the same weight listed for the 1.5L and 3L bladders. It seems highly improbable to me that three different sized objects weigh exactly the same. More likely, the manufacturer’s listed weights are inaccurate. I am assuming that the Source bladders will be heavier than the comparable Platypus Big Zip SL and that they have the potential to be slightly lighter than a Camelbak, but that is only a guess. I would rather not purchase a Source bladder without knowing an accurate weight. For now, I think I will buy another 2L Platypus bottle to replace my leaky one. Despite the durability issues, they seem to be the best mix of price, performance, and weight. 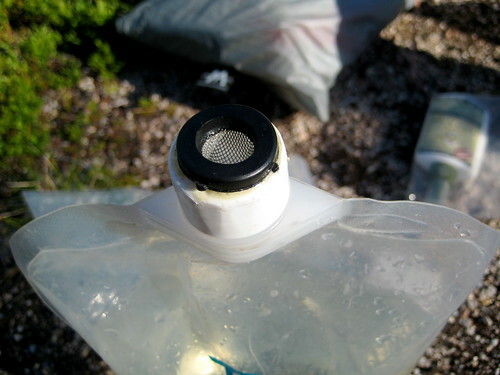 They must be thought of as disposable, but that is true of all plastic water carriers. I’m not sure why they have lately become more difficult to acquire from large retailers. Does anybody know of any other options that I have overlooked? 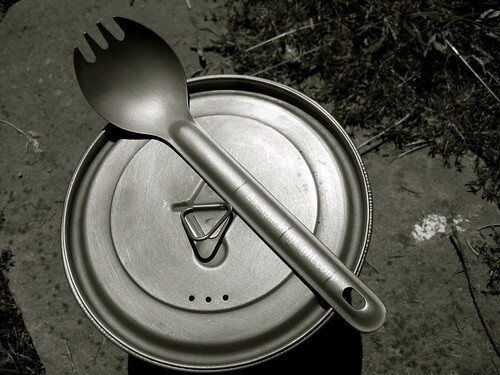 This post was published on 2010-04-25 . It was modified on 2012-09-15 . It was tagged with water, gear. 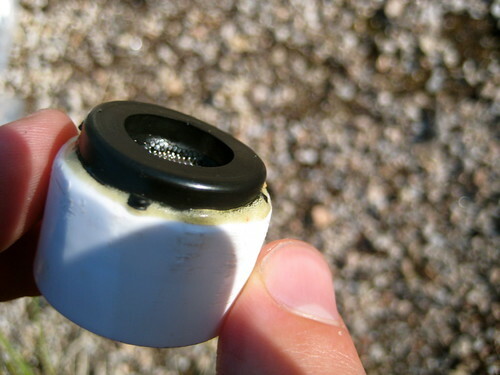 Last year, Backpacking Light published a review of the MSR Hyperflow filter. It was one of their subscription-only articles, so I never read it. Apparently, the reviewer attempting to filter only slightly-less-than-clear water and experienced a very quick build-up of material in the filter element that could not be removed by back-flushing and vastly deteriorated the flow-rate of the filter. Since the review, MSR has acknowledged the problem and released a new filter cartridge to address the problem. 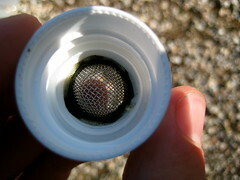 Yesterday, Backpacking Light published a second review of the Hyperflow, this one using the revised filter cartridge. The reviewer once again experienced the same problem, with only a slight improvement in the flow-rate of the filter once clogged. What caught my eye in the second review was that MSR was offering free replacement filter cartridges to those who had filters manufactured prior to November, 2008. The cartridge is the most substantial component of the filter, and getting a new one is a bit like getting a whole new filter for free. This afternoon I called Cascade Designs (MSR’s parent company) at 1-800-531-9531, read them the serial number on my filter, and there is now a new filter cartridge in the mail for me! MSR customer service gets two thumbs up, even if there may be issues with the product. This post was published on 2009-05-20 . It was modified on 2012-09-15 . It was tagged with water, filter, gear.